I was born and raised in Miami. 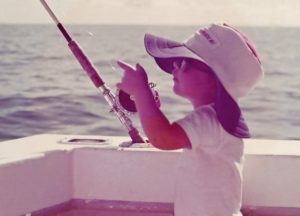 There were a lot of opportunities to fish in South Florida and my father took me every chance he could. I made friends at school and in the neighborhood and some of their dads had raised them fishing as well. 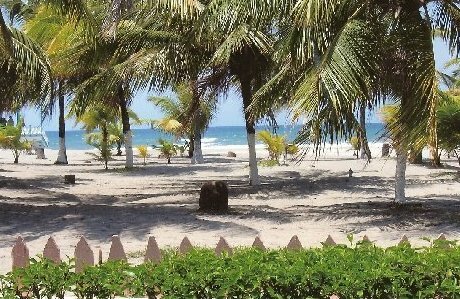 My father’s father had left Honduras and retired to Sarasota by then. He still loved to fish and sometimes I was lucky enough to fish with him. He was one of the best fishermen I ever knew. 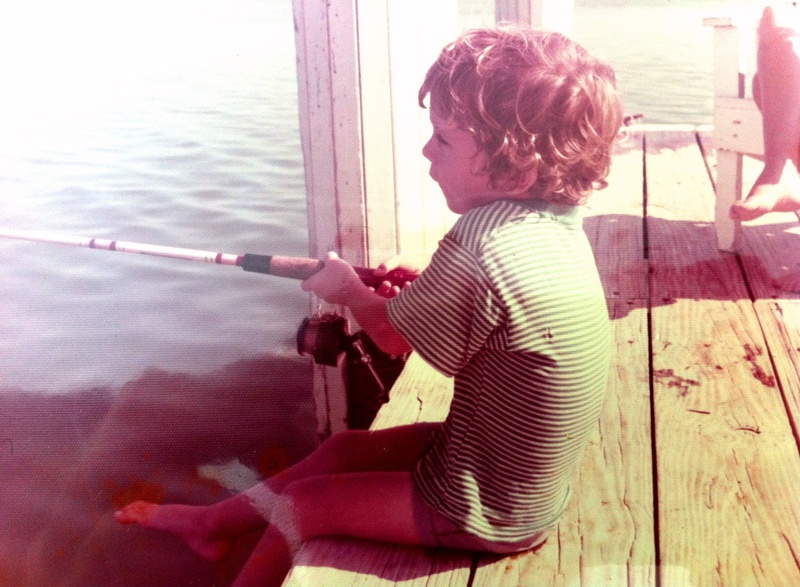 Every year on his birthday he would walk from his house down to the water and catch a snook. Even into his late 80s. 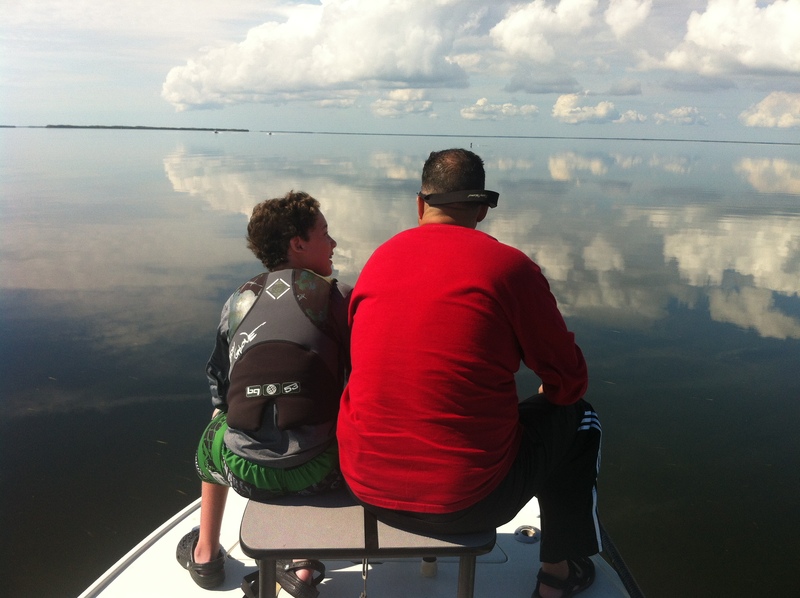 Over the years I’ve accumulated some really great father-son fishing clients. I especially enjoy taking these trips because they are such a great setting for bonding and I get to be part of some very special moments that will be cherished for life. One of my favorite pairs is Mark Charley and his 12 year old son, Michael. I have been taking them out several times a year for four years now. We haven’t missed Michael’s birthday rain or shine. They have a have a great relationship and the love between them is palpable. Mark has mastered the balance between stern, respected and revered father with buddy, best friend and confidant. From what I’ve seen, those types of relationships don’t just happen. They take a lot of hard work, love and discipline. One morning a year or so ago, Michael showed up to the boat with a list of fish and corresponding numbers. At first I thought it was a projection of that day’s catch and I was horrified. I’m a big believer of Murphy’s Law. You should never brag about fish that you’re ‘going’ to catch. It’s a sure way to get skunked. It turns out that it was not a projection, but a fish point tallying system (I was okay with that). He had just taken our fishing to another level. Each fish is assigned specified points. The more desirable or hard to catch the species, the more points it is assigned. Some fish have three point assignments; under legal sized, legal or slot sized and over slot sized. An example would be the redfish. A redfish has to be at least 18” to keep. It also must be less than 27” to keep. That means a “slot” redfish must be between 18” and 27” to take home and eat. 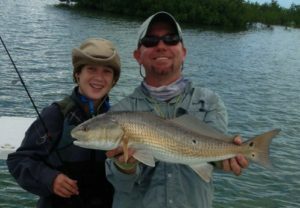 So in Michael’s point system any redfish caught earns 2 points. A redfish between 18” and 27” earns 3 points and a redfish over 27” earns 4 points. A catch means pulling the fish to the boat, out of the water or reeling the leader up the rod tip. Jumping a fish off or having it spit your hook out of its mouth while it is airborne does not count as a catch. (Sorry Michael) There are also species that actually count against an angler. They are considered undesirable or “garbage” fish. They are the lizard fish, catfish, boxfish or toadfish. Each one is worth -1 point. 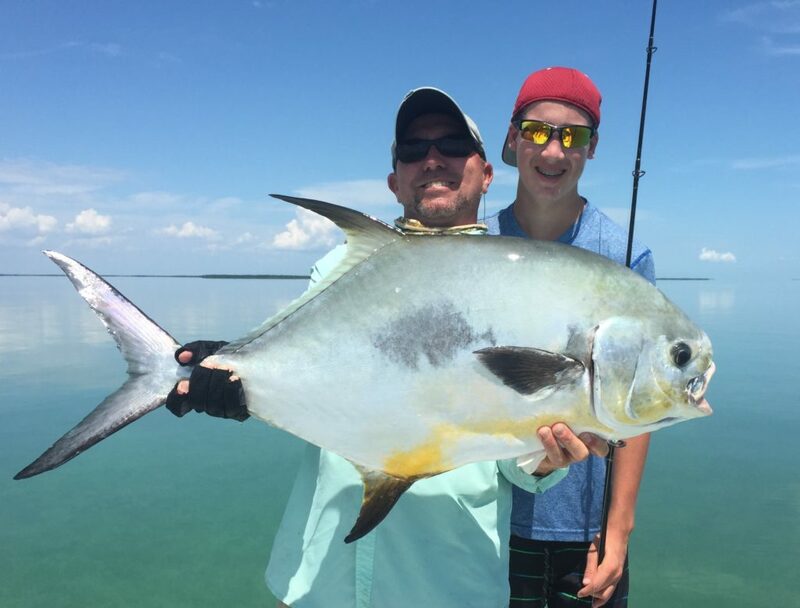 The angler may take their time reeling in these fish in an attempt to lose them, but once it is at the boat, out of the water or the leader is in the rod tip, the point is deducted. Michael, ten years after I first met him with his first permit. We had a blast on our most recent outing this past week. The competition was fierce, but friendly. We were neck and neck for a while, but slowly but surely Mark pulled away with the lead and would not be caught. The day’s end tally had Mark with 72 points, Michael with 48 points and Captain Dave with 30 points. The categories counted were trout, over 18” trout, jack, lady fish, over slot redfish, bluefish, snapper, pinfish, lizardfish and catfish. We had a break off of a snook and a shark which count for nothing, but are worth mentioning. Aside from the fish caught were a lot of laughs, a gorgeous glass-calm day, pod after pod of beautiful playing, feeding and mating porpoise, a big shark, a dozen tailing redfish, a loggerhead turtle and we even ran into a couple of good friends out on the water. Overall it was an awesome day and we all went home winners! My great friend Gainey fishing for sailfish. He likes to remind me that he was only 2 (not 3) in this picture. Previous Previous post: Salmon Fishing in Chicago: Who Knew?